Silent Site Sound Blocker is a free browser extension for the Chrome web browser that acts like a sound firewall when you are using the browser. Audio plays a big role on the Internet. Any modern web browser supports audio playback. You come into contact with audio on a variety of sites: there are multimedia sites like YouTube or Spotify, Internet Radio Streams, and game sites to name just a few. Generally speaking, you may want to separate audio on the Internet in two groups: where it is part of the experience, and where it is used for something that annoys the hell out of you. While you would expect videos on YouTube to have sound, you probably don't expect that site with the flashy ads or annoying notifications to have sound as well. Allow Whitelisted Only -- This setting plays audio only if the site is found on the whitelist. Block Blacklisted Only -- This plays audio on all sites except on sites that are on the blacklist. Silence All Sites -- This blocks audio playback on all sites. Allow All Sites -- This allows audio playback on all sites. The default audio setting is to allow audio playback on whitelisted sites only. You may change that at any time by right-clicking on the extension icon and selecting another mode right there. Alternatively, open the add-on options and modify the default setting there instead. The right-click menu lists options to whitelist or blacklist the site you are on directly. This is useful if you have selected one of the two first modes to control audio in Chrome. Note: Silent Site Sound Blocker displays a prompt when you load a site in Chrome that requests audio playback permissions. The prompt only displays if you have selected the allow whitelisted or block blacklisted modes. There is however no way to block the prompt from appearing on sites you connect to for the first time. This is likely done to inform you that a site attempts to play audio, as you may not realize that otherwise. The latest version of the extension ships with a setting to disable the prompt. The extension settings provide you with options to manage the blacklist and whitelist. You may add sites manually to either list, or remove sites from a list. Silent Site Sound Blocker works as advertised. All sounds are blocked if you install the extension. This works reliably and without any issues whatsoever. 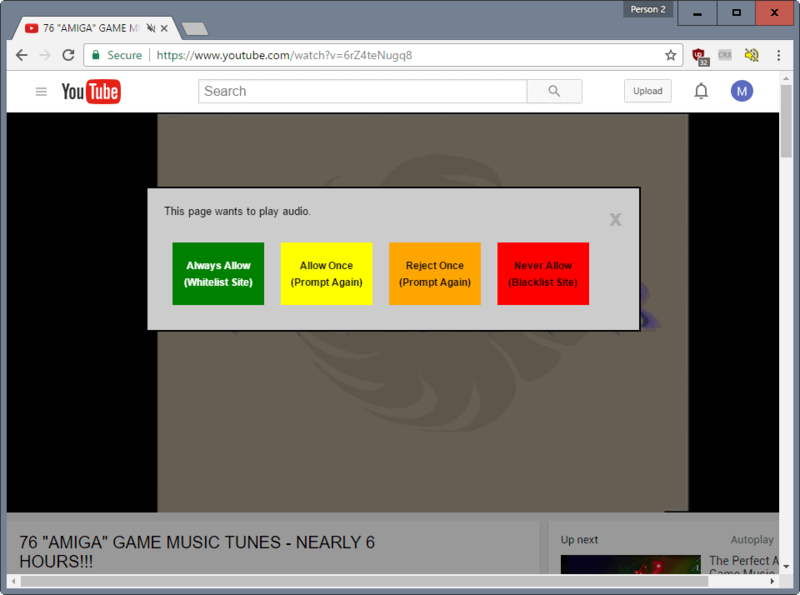 It is therefore a great solution if you want full control over sound playback in the Chrome browser. The prompt that the extension throws by default whenever a site tries to play audio can be somewhat annoying, considering that you get this prompt on sites that use audio for "annoying" things and not for the main experience. An option to turn the prompt off would be a welcome addition. The prompt that the extension displays by default to indicate that a site attempts to play audio can be turned off in the settings. It’s a shame that if you block ‘auto-downloads’ via Chrome you can’t block Audio/Video (especially HTML5) yet, because for some user without unlimited data this can be pain, because it tries to load all the stuff in the background which is an huge issue. There exist also no addon for that, because none of them working – it’s HTML5 issue. Besides this, the addon seems in some situation good, but I’m looking forward to get an Audio mute option within Chromes permission manager which would be better. Thanks for trying the extension (I’m the one that wrote it). Interesting comment about removing the prompt, which I agree can be obtrusive. How would you want to be notified (if at all) that a site wants permission to play audio? I could just have the extension icon change into some kind of question mark and then you could use the right click menu to grant permission or not. I know that getting modal dialog boxes is a PITA. I’m just trying to trade off awareness (site is trying to play audio. perhaps you want to let it) and convenience. 1. 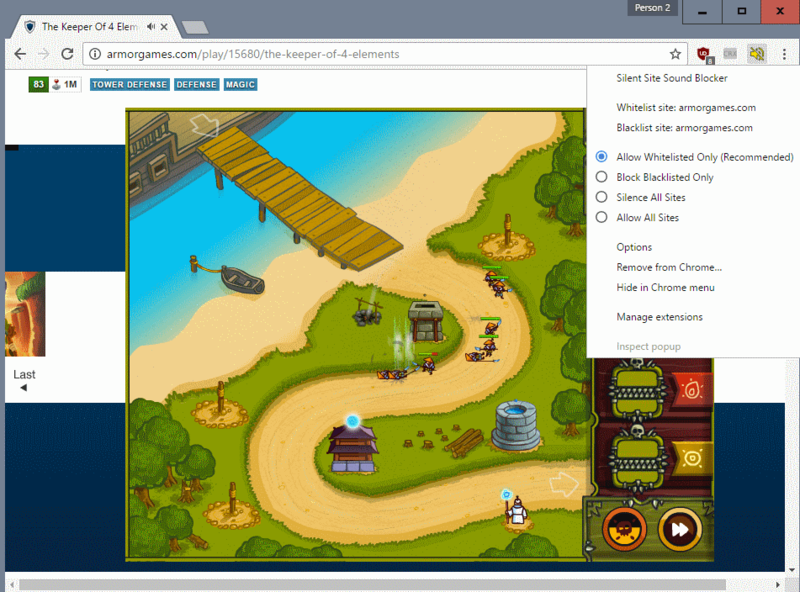 Block all background tabs — if checked, this would only allow the tab in the foreground to play soun. 2. Quiet hours — a bit more complex to add, this would let you set times of day where the whole browser would be quiet. Any of these sound interesting? Avram, thanks for stopping by. The icon notification would be less obtrusive but there is a chance that users would not notice it. I would prefer it over the current implementation. At the very least, I’d like to see an option to turn off the prompt in the options. Playing only in the foreground sounds really interesting, and quiet hours to. I’d favor the first over the second though. Marin, I’ve incorporated your advice into version 0.95. There’s now an option to disable the prompt. Whether the prompt is on or off, the app icon shows a speaker and question mark to indicate that the site is asking for permission to play audio. I also added a help FAQ and fixed some bugs. Avram that is wonderful, let me update the review asap.